Once your student is able to read, how do you get them to continue practicing and building their skills? For our latest review, my 2nd grader was able to enjoy reading The Magic Stories from Allsaid & Dunn, LLC, publishers of The Reading Game and authors of the Wordly Wise series. This set of 6 books is designed to be used with 2nd and 3rd grade students who have finished a solid reading program, but could still use some practice with their reading, comprehension, vocabulary, and overall confidence in language arts. The stories are PDF files that can be viewed on an electronic device or computer, or they can be printed out and used as a hard copy. I like the flexibility here because sometimes we have access to our home printer, and sometimes we’re out and about and need a quick lesson to throw together! 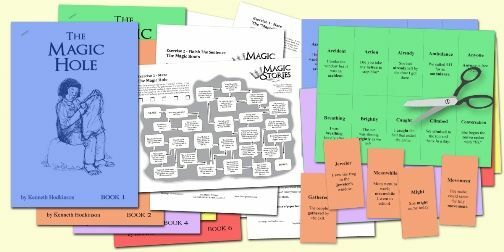 The Magic Stories is portable, even when printed out, or can be used digitally. The stories are beautifully illustrated in black and white. If you choose to print them out, your child will be able to color the pages if they wish to customize their reading experience even more. At the end of each of the books, there is a list of 40 words that are designed to challenge your young reader. They recommend going over these words before reading the story so that the student won’t get frustrated when faced with the new words. Included with the downloadable extra files, there are Naughty 40 Cards to print and cut out. These could be used to review the words prior to reading the stories, and used again to ensure that your student understands them as vocabulary words as well. There are sample sentences to remind them how the word is used. In addition to the Naughty 40 Cards, each story comes with a packet of 4 exercises. There’s a Maze, Finish the Sentence activities, Imagine writing prompts, and a Finish the Story page. My son and I loved the Finish the Story pages. They could choose from a few different story openers. My son isn’t a super strong writer yet, but we’re working on getting his creative juices flowing, so we enjoyed doing these exercises orally. The rest, I did have him hand write his answers, but I wanted to keep it fun and to keep him engaged without making it a chore to complete. By doing it the way we did, I was successful in making The Magic Stories an experience my son looked forward to. There’s also a section to test reading fluency for each book. There’s a page that has a 100-page excerpt from the story and a place for you to write their name, date, and accuracy. This would be a great diagnostic tool, particularly if you had a struggling reader at the beginning of the year. Try them again with the same test a few weeks or months later to ensure that they’re improving their reading fluency skills! There is also a Pre/Post Naughty Words assessment you can give your child for each story. It lists the Naughty 40 words for that selection and then has a place to check if they understood or recognized the book, first before the book and then after they’ve read the story. I used this with my son and only used the Naughty 40 cards for the words he missed in the pretest. He liked only working on a fraction of the cards at a time for review, and I loved having a pre and post test available to test for further understanding. These stories are sweet to read, with a nice little moral to each one. They are at a great level for my 2nd grader. It’s a bit of a challenge, but he mostly has it mastered. I love that he’s gaining confidence in his reading and also learning new words and how to use them. The writing required for the additional worksheets can be as involved or minimal as you want, depending on your own child’s needs. For us, we compromise a little with some written and some oral. It works, and I am able to still tell exactly what he understands and what he still needs to work on. To see how other families worked with The Magic Stories, click the banner below!